Podcasting Equipment: Does size really matter? – Part 1. I’ve been invited to be a panelist at Blog World New Media Expo in June to talk about podcasting. And in the last few weeks my other panelists and I have been catching up over Skype deciding what to talk about. Yesterday we spoke about podcasting equipment. Specifically the two main approaches one could take when starting a podcast. So I decided I’d write a quick post and explore each method, pointing out the pro’s and con’s over this two part series. I’ll try and keep this as simple as possible, staying away from the geek speak where I can. First off let’s talk about the “mixer method”. This is an approach that a lot of podcast coaches recommend. A mixer is what you plug your microphone into. It interfaces with your recording device and often has 2 or more “channels”. A typical podcast mixer - Behringer XENYX 1002. A channel is just another way of saying microphone input (or any other audio input for that matter). The mixer is NOT the thing that records your audio, we’ll get to that later. There’s a few reasons why the mixer method is good. It offers scope to grow your show and add more guests using the multiple inputs (allowing for more microphones to be added). Some mixers also have basic EQ settings. This means that you can tweak the “top end” or “bass” in your sound as it is being recorded. Once you have these settings configured, it can save a bit of time in post production because there’s no need to run your audio through an EQ filter once recorded. More expensive mixers have built in compressors. This means you can compress your signal as it’s being recorded. To be honest I’ve played around with mixers with built in compressors and have noticed that they add a lot of noise and have decided not to use them. A good quality mixer can be picked up for around $70. A good mixer I use is the Behringer XENYX 1002. A microphone is a VERY important part of your equipment, and an XLR microphone refers to the type of plug the microphone has.The XLR plug is most commonly used in professional and broadcast audio. Three pin XLR connectors are used for balanced audio signals. In basic terms the XLR microphone means that it CAN’T plug straight into your computer or (in most cases) recording device. Generally speaking for an XLR microphone to work you have to plug it through a mixer. A decent XLR microphone can cost around $100. 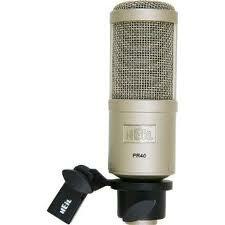 I recommend the Heil PR-40 which costs a bit more but delivers on quality. Most XLR microphones need some kind of stand. You don’t want to hold the microphone as you record because any movement can create awful noises that will be picked up in the recording. 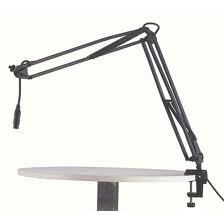 A microphone stand is another expense that can start from $30 and go right up to the $300 mark. A typical microphone arm - not portable! Having a boom or mic arm stand can also take up a bit of space in your recording area and also stops your studio from being overly portable. If you have a mixer then you’re going to need leads and lot’s of them. Personally I hate leads, and in times gone by have felt my studio resembled the Borg mothership (Trekkies will appreciate the reference:)). You’ll need a lead running from the mic to your mixer, a lead running from your mixer to your computer, a lead running to the power socket, a lead running from your headphones to the mixer. And then there’s the other microphone lead….arghhhhh! You might have to spend $20 or so on leads. Generally supporters of the mixer method also suggest to record your audio using an external (often digital) recording device. An example of this might be the Zoom H2 or an Edirol recording device. Some say that using a device like this reduces the noise that can sometimes be heard when you record directly into a computer. But to be honest, with the advancement of audio editors and sound cards, this “computer noise” is rarely a problem these days. Another advantage of recording using this method is that there is less of a chance of a device like this crashing compared to software on a computer. To be fair, I haven’t ever faced a situation where my computer has crashed mid way through a recording, but I imagine it would be devastating. But it’s also worth having a balanced perspective about this. All mainstream media record onto digital software. In fact I did 100% of audio recording in my Radio career into Adobe Audition and never had a big drama. The tip here is most major media organisations are just smart enough to capture the content on more than one bit of software (lesson here is always have multiple recording software). Also – the other thing I love about digital recorders is how portable they are. You can take them with you “on the go” and take advantage of the excellent in built microphone. You can pick up a decent digital recorder for around $400 mark. To complete this set up you may need to purchase a 1/4 phone jack adapter if you need to jack up your headphone plug so it’s compatible with the mixer. Not much at around $2 a pop but everything adds up huh? The mixer method is one that I really like and sometimes recommend to clients. But it is not for everyone. So, just to re-cap, let’s take a look at the overall pros and cons of the mixer method. 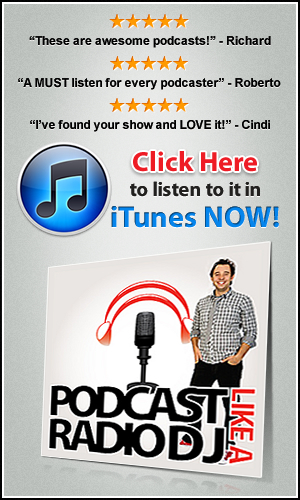 See you in Part 2 when we go into detail about the “minimalist method” of podcasting! I use a kick drum mic stand for my microphone. I have little free desk space and since I stand when I record I still have plenty of boom left on the stand and is still solid. They start at about $25. Hey thanks for the heads up Charley. Yeah a kick drum mic stand would work very well! It’s important to stress how important quality leads are. The worst thing you want is ground loop noise if you’re using a dynamic mic + mixer + digital recorder set-up. 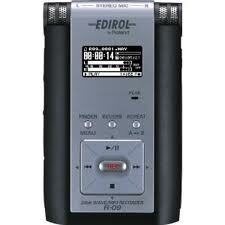 I personally like the Zoom H4N but the difference between that an the Edirol (or Roland) is negligible. What will affect your sound, though, is a poor quality flash memory card. Personally I find the SanDisk Extreme HD Video Flash memory cards are the best quality. I’d be wary of the Behringer XENYX 1002. Get a similar priced mixer with faders instead of knobs that you have to twist round. Faders are easier to control, especially if you’re juggling sound levels as you record your show. Thanks for stopping by and for those excellent points. I’ve found the Behringer mixer is a good starting option for those who’d like to have more control over their recording but aren’t ready to jump in at a higher level. I definitely agree with you about faders as opposed to knobs though – much easier to control. Is there a mixer that you’d recommend that you’ve had a good experience with? I use a baby Behlringer 502 more as an input control deck rather than a mixer. It works just fine as most of my production is done in post through Audacity. I have Audition 1.5 but in truth I am so used to Audacity, even with all its foibles, I stick with it. I run a radio program on community radio RPPFM and do all of my work off station just going into the studio to load up the program. On that topic consider joining your local community radio as a volunteer, you will learn a great deal and if they train you in post, well take all you can get. I have a little Zoom 1 which was $100 from the US. I have to say I was totally gobsmacked by the quality plus it can record 2.5hrs of WAV on the supplied card. It is not robust but boy the soulnd is sweet as a nut. Everyone should have one blog or no blog! So, I am a ‘postie’ a producer that sees the computer and recording software as a blank canvas where I can mix noise to communicate, entertain and, just maybe oneday, make a few bob in my retirement. Good luck at the Conference! Excellent post, really interesting stuff. 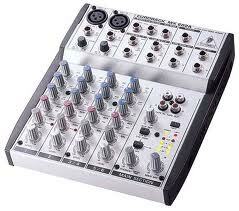 One thing I’m wondering though, is the Behringer mixer you suggest seems to only allow for 2 mics? Is this the case or am I just misreading the specs? Yes the mixer allows for 2 microphone inputs (XLR). Next post: Podcasting Equipment : Does Size Really Matter- Part 2.